The piste is 14 metres long and 1.5-20 metres wide. Fencers begin a bout behind the "en garde" line (2m from centre), and return to the en garde line after a valid hit is scored. 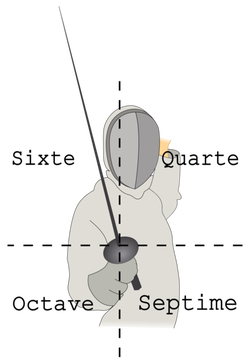 If a fencer moves behind the "end" line with both feet, a point is given to the opponent. If a fencer moves past the "side" line with one foot, the referee stops the bout and starts fencers in the middle of the piste. If the fencer moves past side line with both feet, the referee stops the bout and moves the out of bounds fencer back one metre. It is important to show respect for your opponent and the sport of fencing by saluting prior to a match. To salute you face your opponent while holding your mask under your non-sword arm, put your heels together, point the tip to the floor, raise your guard to your chin, and bring your tip back down to the floor. At the end of a bout we recognize the effort of our opponent by shaking hands using our non-sword hand. The parry is used to deflect the attacker’s blade from the defender’s target and take “right of way” to score a hit. The offensive action that follows a successful parry is called a “riposte“. In week 3, we practiced 2 lateral (side to side) parries. The parry quarte protects against attacks to the high outside line, and the parry sixte defends against attacks to the high inside line. As your attacker’s point passes your guard, make brief contact with the attacker’s foible with the forte of your blade, moving your arm and blade at the same time. It is important to keep the point of your weapon pointed at your opponent during your parry, so that your riposte can follow immediately. When visualizing a parry, we thought about a car windshield wiper moving from side to side. We practiced clapping our hands in front of our bodies, but only moving our weapon hand. This action is very similar to the parry quarte.